AP GO 132 Child care Leave two months for AP Women Employees, AP Lady Teachers PRC GO.132. Sanction of Child Care Leave 60 days to Women Employees leave Rules and Guidelines as per 10th Pay Commission Recommendations. Andhra Pradesh Public Services Finance Department PRC 2015 on Child Care Leave Sanction of Child Care Leave for two months to the women employees of the State Orders. AP Finance (HR-IV-FR) Department G.O.Ms.No.132 Dated. 06.07.2016 is about Child Care Leave for women is as follows. 1. 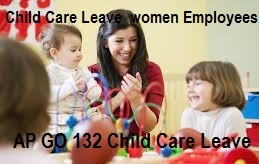 In the references read above, the Associations requested for sanction of the Child Care leave to all women employees.